There is a certain quote uttered by one of the US presidential candidates that keeps coming back to me. Perhaps you can guess which one said it. “I am a great leader; I tell people what to do and they do it”. I cringe every time I hear that quote or even think of it. I remember the first time I heard it used. I had to stop and replay it to make sure had I heard it right. If you are any scholar or practitioner of leadership I hope you also caught what made me cringe. The manager is a copy; the leader is the original. The manager relies on control; the leaders inspires trust. Leadership is taking a different tack to the good old “command and control” model, where you just tell someone to do it and they do it. You may actually get things done, but what are you creating in its wake? Let me be clear, there are definitely times that a leader has to be in “tell mode”, especially in the case of a safety issue or a new employee in training, however even in these situations the “telling” should shift to a more “ask” approach quickly. A leader must become more of an encourager than a demander. When you encourage someone – make it personal. Tell them personally how you much you believe in them. Don’t be the kind of person who might tell others how much you think of them but never bothers to mention it to the one who really needs to hear it. When you encourage someone – be specific. Tell the person you are encouraging exactly what it is that you appreciate about them. Is it their timeliness? Their work-habits? Their quality of work? Do they chip in and help out when they wouldn’t have to (team-players)? Being specific will give them clear examples of what is pleasing to you, expected from you, etc. This specificity will encourage future positive actions as well. When you encourage someone – don’t hide it. Be appropriate but be public when at all possible! By letting others know how you appreciate someone, it will also give them an idea of what you are looking for, if, for example, you are their boss. When you encourage someone – understand the importance of purpose. What goal do you have in mind when you are encouraging someone? Maybe this sounds calculating (it isn’t meant to), but it’s important to think through your actions. Is the purpose of your encouragement related to a specific, hoped-for outcome? If not, why not? All I’m asking you to consider is thinking about the purpose of your actions. 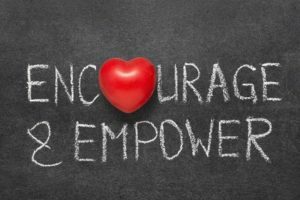 If you can learn to practice the four tips above, soon you will become a “great encourager” and that’s a great thing to be known for!